Last Monday, the handing out of the cheques took place. 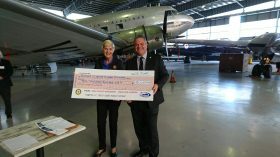 The selected charities were nominated by each of the 5 Rotary Clubs of the upper Illawarra. 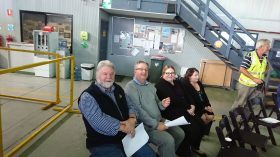 The money came from the event managers of Wings over the Illawarra, Kerry and Mark Bright. The Bright’s have been generous to Rotary for a number of years. This generosity was extended to this year as the Bright’s gave to Rotary $10,000 to distribute to our chosen charities. 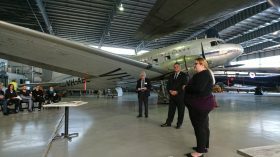 The handing over of the cheques was held at the HAR’s Hanger. The same one we held our Swing into Wings event in May. Our club was represented by Stephen Swan, President Elect Brian Ashe and I. We heard from each of the Charities as to what they were going to do with the money they received. Our club gave to Supported Accommodation & Homelessness Services Shoalhaven Illawarra (SAHSSI). It was interesting to note that Rotary Club of Corrimal used their proportion for their literacy program, which is a great cause. The 4 Rotary clubs gave to charities that look after the welfare of the homeless, feeding people on the street or youth who are at risk.